Licensed TV tie-in comics, once an automatic pass from many comic fans, have seen a massive resurgence in the last half decade, with Oni Press’s Rick and Morty series near the very top of the pack. Produced in collaboration with Cartoon Network and Adult Swim, Oni’s Rick and Morty comics capture the bonkers spirit of Dan Harmon & Justin Roiland’s cartoon and have seen contributions from creators including Kyle Starks, Tom Fowler, Tini Howard, Katy Farina, Marc Ellerby, Zac Gorman and many more. Now, the core Rick and Morty series is approaching a major milestone: its 50th issue. Throughout the week, Oni Press is revealing various details about the 50th-issue celebration, including exclusive covers and reprint plans, and Paste is thrilled to debut the latter. 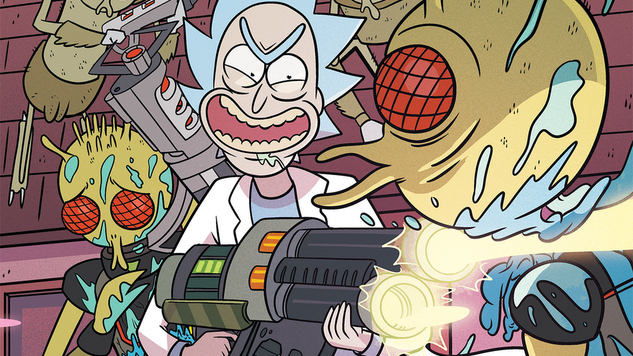 To commemorate Rick and Morty #50, Oni Press is reprinting the first five issues of the series with brand-new connecting covers from artists Marc Ellerby and Sarah Stern, which Paste readers can check out for the first time below. Rick and Morty #50 hits stands May 29th. Stay tuned to Paste for more on the series milestone as it approaches. Dan Harmon & Justin Roiland’s hilarious hit Adult Swim animated series Rick and Morty now has its own comic book series from Oni Press! Join degenerate superscientist Rick Sanchez as he embarks on all-new insane adventures with his awkward grandson Morty, his teenage granddaughter Summer, his veterinary surgeon daughter Beth, and his hapless son-in-law Jerry. In this issue: Part One of “The Wubba Lubba Dub Dub of Wall Street”!